The mission of Project Green Leaf is to promote and support a local agro-food system. Project Green Leaf is dedicated to sustaining local agriculture by strengthening community between farmers and consumers, thus providing for better quality of living. By promoting various activities, such as direct marketing and educational/outreach programs, we assist in developing the connections necessary for a local agro-food system. Imagine eco-friendly clothing with a kick - home décor that is more than a burlap sack. Step into an oasis where you can surround yourself in fashion forward lines such as Linda Loudermilk and Sameunderneath, or furniture and décor from Modern Bamboo and Green Glass. Our mission is to provide practical information in an entertaining format to help green every home in America. There are 130 million homes in the United States alone. More than half are over 35 years old and 58 million have zero insulation! Because homes in the U.S. use 22% of the nation’s energy, we must improve our existing homes so that they eventually use zero carbon. It is the best way to save money, help the economy, create jobs, make our homes more comfortable and help to avoid climate crisis. For San Francisco to be more sustainable, we need to grow more of our own food. To plant more fruit trees, we need to show the city we can manage the harvest. SF Glean is a entirely volunteer project that harvests fruit and nut trees and donates the harvest to various food banks, pantries, and food programs in our San Francisco communities. Organization offering Permaculture teaching and activities primarily focused on San Francisco, but may be open to the whole Bay Area. Urban Permaculture Guild educates and inspires communities and individuals to creatively transform how they live and the urban places where they live. We facilitate artistic and ecologically-oriented placemaking and educational projects that honor the interconnection of human communities and the natural world. The Urban Permaculture Guild is a project of Architects / Designers / Planners for Social Responsibility (ADPSR), an educational non-profit organization founded in 1982. ADPSR works for peace, environmental protection, social justice, and the development of healthy communities. The Guild operates under the direction of Katherine Steele. A blog about ecologically conscious parenting. An online community devoted exclusively to media, public relations and marketing professionals (or business owners and executives) who have the job of communicating new developments and trends in what promises to become a Greener world. Washing the clothes is one of those core required energy and resource intensive things we do. Modern washing machines use a lot of water and electricity, as well as chemicals (laundry detergent) that may be creating unwanted environmental effects. Washing the clothes also involves drying them afterward, and this year I've been experimenting with energy efficient ways to dry my clothes (hint: clothes lines). Now a new process is becoming available that can use as little as a cup of water and use a different sort of detergent. They claim to have developed a new way of cleaning clothes using less than 2% of the water and energy of a conventional washing machine. The process is based on the use of plastic granules (or chips) which are tumbled with the clothes to remove stains. The Xeros web site makes it clear this involves a specially designed washing machine, and that the machine still tumbles the laundry. One issue with modern laundry methods is that the machines damage clothes (but so does pounding clothes on rocks in a river). Their website makes it clear not all the beads will be removed from clothes by the machine. The Xeros web site explains that the technology is applying the process of anchoring dyes in clothing, but doing it in reverse. 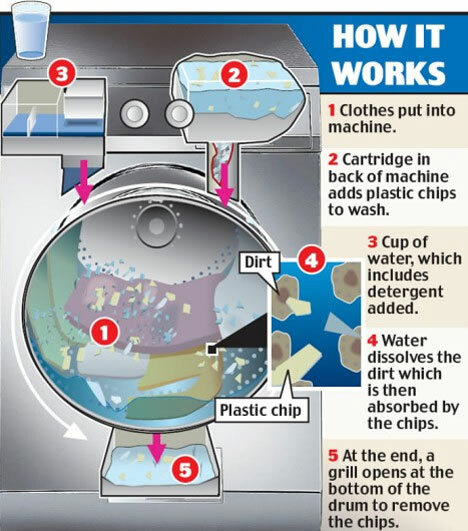 The plastic chips absorb stains from clothes into the chips. The nylon polymer has an inherent polarity that attracts stains. Think of how your white nylon garments can get dingy over time as dirt builds up on the surface despite constant washing. However, under humid conditions, the polymer changes and becomes absorbent. Dirt is not just attracted to the surface, it is absorbed into the centre. This is exactly what happens when Xeros nylon beads are gently tumbled with dampened garments. There are multiple ways that Xeros will save you money. The dramatic water saving; reduction in electricity through shorter cycles; using less detergent. Even with the extra cost of the beads, we project Xeros has the potential to save up to 30% of direct operating costs. On top, there is the indirect cost savings of faster through-put, less effluent and no need to tumble dry. Because the process uses so little water, there is little reason for machine based drying techniques. Hanging the clothes to dry them should be sufficient. The Xeros product is not yet ready for consumer use. Their website repeatedly says it is in prototype development, then it will undergo testing. Further they are not immediately targeting consumer use, but instead industrial use. This includes hospitals, military, and the dry cleaning industry. A Boutique Investment Banking Firm. Their current focus is on helping America to focus on Renewable and Green Energy, in order to help reduce our dependence on Foreign Oil. They claim to have committed to acquiring or building 100 new Green Energy Power Plants, focusing on Cogeneration and Solar Technologies. That is they appear to be managing a portfolio of investments or full ownership in green energy production facilities. In turn they offer investors to buy into their investment portfolio.